YouGov has a massive database of consumer and voter and lifestyle preferences based on 200,000 people which they have made available online for ‘profile’ access. You can’t drill into the data, for that you have to pay upward of £4,000 – but it’s a taste of the data that they have. Visitors to the YouGov Profiles website are invited to type in “any brand, person or thing” – and will be presented with a typical persona of a consumer, fan or user. Using it we discover that the owner of an Apple iPhone is more likely to be a professional woman with politics in the centre. An Android user is more likely to be male, lower middle class and left wing in their politics. 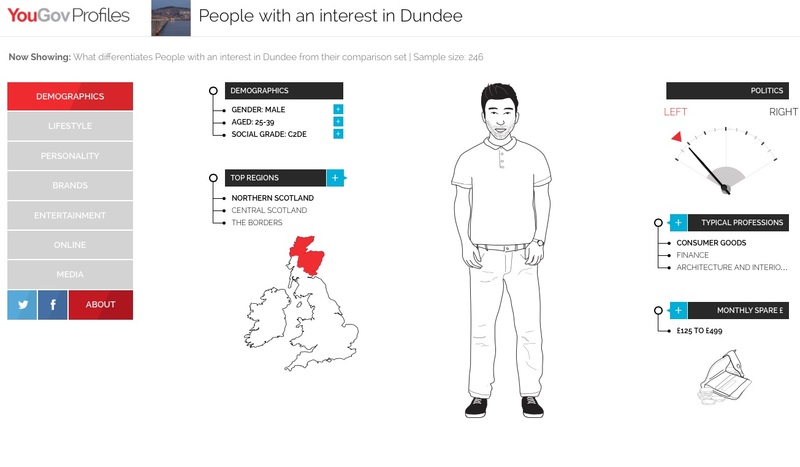 So, what sort of typical person has an interest in Dundee? A male around 30, working class, with voting preferences bordering on the Marxist. Lorne sausage and Madeira cake are amongst their favourite foods, they are keen on tennis and possibly keep a budgie. They drive a Kia, shop at Tesco and Burton is their tailor of choice. They read The Scotsman and Reveal Magazine, and favourite entertainment includes Gary: Tank Commander and Roger Daltrey. But people who like the University of Dundee are more likely to be professional women aged over 40, conservative in politics with a taste for brown rice and horse racing, driving a Peugeot and reading The Herald. Admirers of Alex Salmond shop at Lidl and drive a Skoda. If they invite you to dinner it’s likely there’ll be a Forfar Bridie involved. They like watching Braveheart, listen to The Stranglers and are regular readers of New Scientist. Yes, I too began to doubt the veracity of this when it got onto reading preferences. But they’re bang on when it comes to the typical Arsenal fan: a posh woman in her early 20s who shops at Waitrose and John Lewis and reads The Guardian and The Economist. She has a taste for empanadas and probably keeps a goldfish. I myself am broadly in the demographic of the wearer of Paul Smith (although my salary only really stretches to the socks, and I got given those as a present), a professional male of a certain age with a taste for Jack White, Morrissey, and Apple computers. However the real oddity is this: their politics are clearly left of centre, but they read The Telegraph. Go figure that one out. YouGov profiles are probably a useful starting point for developing personas and I can see a role for it in teaching. They help to demonstrate differences in values as expressed by brands. As a starting point for other research I feel there us much to commend it. But if I was V&A Dundee planning their launch campaign, I probably wouldn’t rush to sign up Roger Daltrey. The Design Transitions book (co-authored by Joyce Yee, Emma Jefferies and Lauren Tan) captures stories of how design practices are changing from different perspectives and context, featuring 42 stories covering 6 design disciplines and 16 countries. 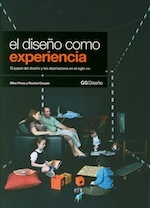 The book is about conversations on how design is changing. 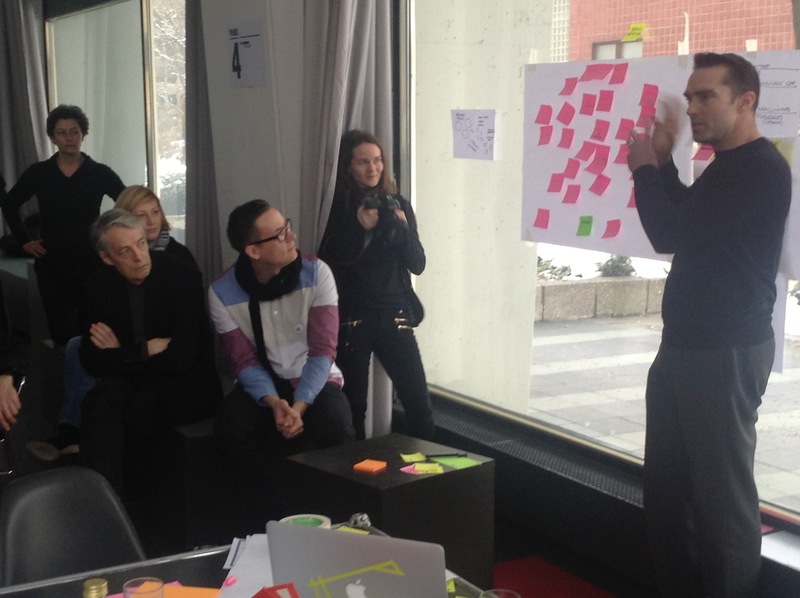 Transframers is a tool to support the design research process. It helps you to understand your changing role as a design researcher. It is applicable from research students to large research teams. It helps you position yourself and your practice. This tool was the outcome of a two day DFG Roundtable on Design Research held in March 2013 at the Design Research Lab, University of Arts, Berlin. 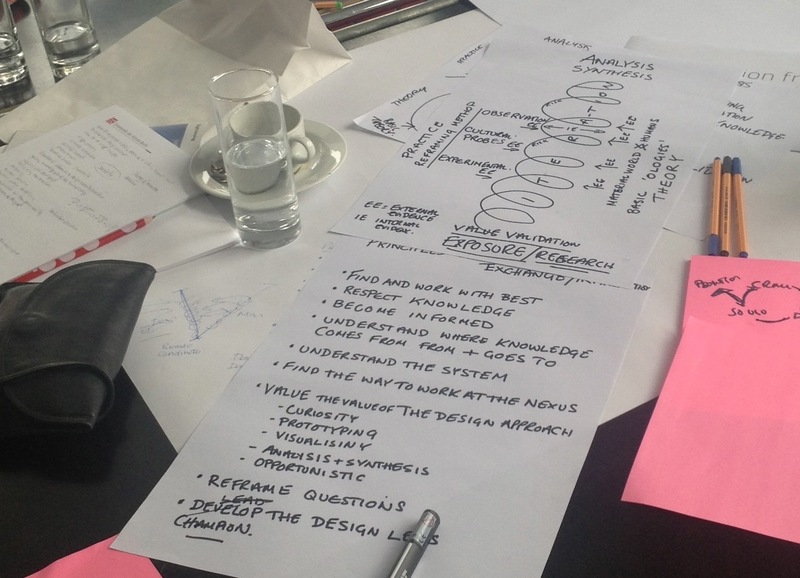 The organisers invited a combination of German and international design researchers to meet and explore four key themes that lie at the heart of design research. I was part of team that included Cameron Tonkinwise, Rachel Cooper, Chris Rust, Klaus Krippendorff, Michael Hohl, Sabine Foraita, Tom Bieling, and others. We explored the relationship between design and other academic disciplines. Early on in our discussions we considered it important to focus on an ‘end product’ – a concrete outcome that we could adapt and explore further. In that sense we tried to incorporate the best elements of design jams into this academic discourse. One of the issues that emerged was that of the variety of roles that the design researcher (or indeed the design practioner) can take on during the research process. We wanted to develop a tool that helps define these roles, provide alternatives and act as a diagnostic. Transframers was proposed as a highly rough prototype. In the spirit of prototypes we invite you to explore it and use it, and help us refine it. We are laying out the basic idea and some suggestion on how it can be used. The initial ‘napkin’ version of this is below. At various points in the two days we would report back to the larger group of people. Below Cameron Tonkinwise is presenting our work. Clive Dilnot from Parsons in NYC looks on. Discussions over dinner and outside the formal sessions fired us up to accelerate our process of discussion and link it to REAL research, rather than discuss in the abstract. The Berlin PhD students shared their work with us and provided a great focus for exploring how design researchers applied the principles we had defined the previous day. We also began to define some personas (as we initially described them) of how researchers behave in a research context. This evolved into a set of roles. The idea is that the role taken on by a researcher (whether a PhD student or a project director at the head of a large team) constantly shifts. It is important to be aware of how these shifts occur as this reframes our relationships with others and determines how we see the subject of our research. We decided to move towards creating a real tool, a concrete outcome of the two days that we and others could go off and use and adapt further. The tool is about translation, but it is also about framing questions, and framing our own practices in research (and creative practice), hence transframers. I took on the task of creating a website in the final hour of our discussion, leading up to a public presentation of all the deliberations coming out of the two day event. That accounts for its very rough character. We presented Transframers to an audience of 150 or so people as a drama, with Cameron as the sagely professor and Rachel and I as two very difficult and problematic PhD students. And we are all rather hoping that evidence of this never finds its way onto YouTube. Today marked the start of my postgraduate module on design research for our new Masters students at Dundee. We have around 40 students from around the world (from Bahrain to Beijing, Romania to Rio, US to UK, etc) covering our three courses in Design for Services, Product Design and Design Ethnography. So far a great bunch of individuals who seemed not to mind about being lectured at for eight hours. The way we teach at Dundee is to compress the taught delivery into one week blocks, followed by three week projects supported by tutorials. That makes the initial week somewhat intense. In addition to my own sessions, today we had short but inspiring and informative lectures from Catriona Macaulay, Hazel White and Jonathan Baldwin. The lectures comprise a vital element in the module in terms of setting the direction, providing the inspiration and energy and giving the personal insights based on our own experiences. However, even without the lectures there’s a great deal that you can gain from the module – even if you’re not attending it. In common with most of our postgraduate design modules at Dundee, we make the content and supporting materials all available online. From the link on this post you can get access to the materials we provide our postgraduate students with. Explore the module website and follow up the further reading and links we provide. On 15 July 2010, Vince Cable – the coalition government’s Secretary of State for Business, Innovation and Skills – set out the choices facing the UK higher education sector in a speech. This included extensive reference to STEM (science, technology, engineering and maths) disciplines, and how they are vital to economic competitiveness, research and scientific and technological progress. Then, in passing, he said that “what my father used to describe as ‘arty farty’ subjects feed into the rapidly growing and successful industries like creative design, publishing and music.” Really? Well, he is Secretary of State, so I am sure he has pored over the evidence on the subject. But here is some evidence that Vince Cable may be less familiar with. The annual Morgan Stanley ‘Great Briton’ awards celebrated the highest achievements in the arts, business, sport, public life, and science and innovation. Each year four people were shortlisted for each of the awards. 2007’s shortlist for the Great Briton in Science and Innovation included a theoretical physicist from Imperial College, an international expert in the pathology of dinosaur bones and John McGhee, an Arts & Humanities Research Council-funded research student based in an art school. His digital animation research on 3D visualization strategies to improve disease understanding among patient groups has twice featured on BBC News and secured the front page of the Guardian’s education supplement (30 October 2007). John is an animator with a background in 3D design. When crop geneticists provided printmaker Elaine Shemilt with their DNA data, their expectation of the science-art project was that it would result in some striking decorative prints that would liven up the walls of their research institute. However, the resulting prints revealed to them the occurrence of new elements and data patterns that they had previously been unable to perceive. The prints led directly to a whole new externally funded research project examining gene progression in pathogens. Within the decorative patterns, new knowledge became visible. Vital research in crop genetics was triggered by the work and insights of a fine art printmaker. With a background in craft-making and product design, Graham Whiteley brought a highly idiosyncratic approach to his doctoral research on prosthetic design. To begin with, the medical physics specialist who was part of the supervisory team saw dubious value in Graham’s emphasis on life-drawing and model-making as his key research methods. Six years later, his research contributed to a new bionic arm and hand that has been hailed as one of the most significant breakthroughs in prosthetics. We look to our art schools to produce great art and design, and their broader value is always pitched in terms of their contribution to Britain’s Creative Industries. However, their recently emergent research culture is producing something else as well: unique contributions to science, technology and innovation in fields far removed from ‘creative industries’. The examples above are taken from a book chapter I am working on that will be published later this year on The Hidden Value of Art & Design. 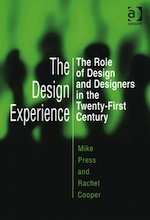 The chapter explores art and design’s contribution to other specialist disciplines, to industrial competitiveness and innovation, and to social policy. 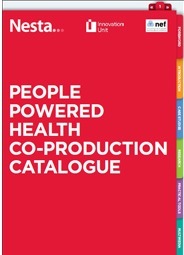 In exploring this value, the chapter ventures from hospital wards to the suboceanic world; we will examine the role of designers in defining advanced manufacturing processes and the role of artists in scientific research; we will see how art and design researchers can contribute to crime prevention, prosthetic technologies and urban planning. The cases I draw upon are not particularly new – but as Vince Cable’s comments suggest, this message on the wider value of art and design is simply not getting through. Recent research by Mary Schwarz and Dr Karen Yair for the Crafts Council is one recent addition to a growing literature on the wider economic and social value of creative disciplines, in the case of their research, craft specifically. So we need to marshal more evidence, more positive cases, and tell the story more effectively. Comments to this post that include other cases are most welcome, so that we can begin to assemble an up-to-date broad based and accessible listing that can help to strengthen research on this issue, and help tell our stories in a more powerful way. This is a reworked version (April 2011) of an earlier post, which benefits from further dedicated time of trying hard to justify the iPad as a serious work tool for the jobbing academic. So, you’re a research student or academic who has just laid their hands on a new iPad. How useful is it as a research tool? What advantages does it have over a laptop? Is it just a clever shiny gadget for watching movies on long train rides? Having been given one ten months ago, my initial impression was that it would prove more useful as a leisure device than as an essential work tool, but now it has found a unique and valuable role in my work flow as a jobbing academic researcher. This post sets out my observations in the hope that they will prove useful to others. I have downloaded all kinds of research and writing related apps, and tried them out. What this focuses on are either the ones that work for me – or which I know work for others, but for whatever reason do not quite fit my own way of working. My reflections are, of course, based on the original iPad, rather than the iPad 2. But if anyone would like to give me one of those, then I’d be more than happy to evaluate it. Let us start with its key advantages over the laptop. Clearly, it’s smaller, lighter and with a longer battery life. For researchers these are important assets, particularly in research gathering settings where you want to be less obtrusive. Taking notes behind the dramatic sweep of a MacBook Pro’s 17″ lid does tend to draw attention to one’s self. So whether doing research in the field, or simply writing stuff up on the train, the iPad has certain physical advantages. The keypad takes some getting used to, but as a note taking tool it is very useful. However, the optional Apple iPad keyboard transforms the device into a serious writing machine for which there are some very good apps. A recent research trip to Africa made heavy use of the iPad and convinced me of its value. Below I focus on four research uses for an iPad – as a research gathering tool, an idea development tool, a reading and browsing tool and as a research dissemination tool. Let us say that you’re doing research in the field. No, more specific: you’re doing research in a field. Unlikely, I know, but if you’re doing an ethnographic study of farm workers, or a survey of urban gardening, or surveying your locality for a Green Map, then this is possible. A laptop would work, although a bit clunky. Now let’s introduce an extra dimension: rain. At this point the laptop becomes a potentially disastrous liability – but not your iPad in a waterproof bag. A number of companies provide waterproof covers that enable the iPad to continue being operated. TrendyDigital is one such supplier, and there are others. So, we can safely gather data in all weather conditions, or just have the option of operating the iPad with our tongue. I have used the iPad for note taking in meetings (inside, rather than in rain drenched fields), and have found the main key advantage is that the iPad is relatively unobtrusive. Well, that’s not strictly true. For the first ten minutes everyone gathers around and demands turns playing with it, but that’s just new gadgets for you. Eventually the novelty wears off and people forget that it’s an iPad. For note taking you have a considerable number of apps available, and I’ve tried many of them. Two, however, stand out. SoundPaper gives you the option of taking a sound recording as you type your notes. Afterwards, when you click at a particular point in your notes, so it will play back from that same point in the recording. As the developers claim: “SoundPaper is perfect for students. If you ever fall asleep in class, don’t worry — SoundPaper’s got your back. Just tap what you wrote while you were awake, and SoundPaper will play the audio to help you fill in the blanks.” This does not apply to students here at Duncan of Jordanstone College, given the highly engaging quality of our lecturing staff, and on the odd occasion that students do nod off, we throw hard objects at them. As my colleague Catriona Macaulay, who runs our MSc Design Ethnography programme suggests, SoundPaper has great potential in design ethnography research. Having used it in several different settings, I find it one of the most useful and distinctive apps for the iPad. The only downside is its reliance on email as the sole method of transferring your notes to your Mac. Notebooks is much more a research and writing tool than merely a note taking tool, and is an essential app if you are going to do any serious work. There is a detailed review here, but I will add a few observations of my own. You can integrate it with Safari, organise your notes in various ways, import and export in a range of formats, and do this wirelessly if you wish. You can use it to set up to-do lists, which can also be integrated with OmniFocus and other applications. Hugely well featured and very well designed. In short, an essential app for research and writing. I have found it much more useful than Apple’s own Pages for iPad, which I cannot really see the point of. A good iPad app should work to the distinctiveness of the iPad, and overcome some of its inherent shortcomings. Pages, which you have to sync via iTunes, just makes the whole process clunky. Evernote is another research tool for the iPad. To be honest, I never really took to Evernote on the Mac, so I have not used it on the iPad. Hoever, some people I know have done, and swear by it. So, in the interests of balance, here is a review that sets out many of Evernote’s positive qualities. Note Taker HD lets you take handwritten notes and sketch. It is a well designed app, and could work for people who prefer writing to typing. I’m not one of them. The interesting thing about it is that it is developed by Dan Bricklin, who 30 years ago designed VisiCalc, the ground-breaking spreadsheet programme. The thing that really really didn’t work for me was writing with my finger. It just feels wrong. So, I made my own stylus for the iPad based on this DIY design. Instead of adapting a biro, I found that a paintbrush that has a metal casing for the bristles works better for holding the conductive foam. If all this means nothing to you, then watching the video in the last link will make all things crystal like. The interface is cumbersome and complicated, as the screengrab below demonstrates. MUJI Notebook is a very recently launched app that, like Note Taker HD, allows you to write on screen. However it also incorporates handwriting recognition – although to be honest either the software is a little wanting, or my handwriting is somewhat illegible: I’ve yet to get it to work well. It has some advantages over Note Taker in that you can import PDFs and photos and annotate them, and the interface is very intuitive. The iPad has great potential as a tool to capture visual thinking – ie: the visualisation of complex ideas, and the relationship between them. But I have yet to find an app that really hits this potential. Notebooks is great for playing with ideas as text, but there is no visual dimension. On the Mac I use Mind Node alongside the brilliant Scrivener, which has a corkboard for restructuring the main elements of a writing project. It was my desire to find some Scrivener-like thinking environment on the iPad that drew me to Corkulous. 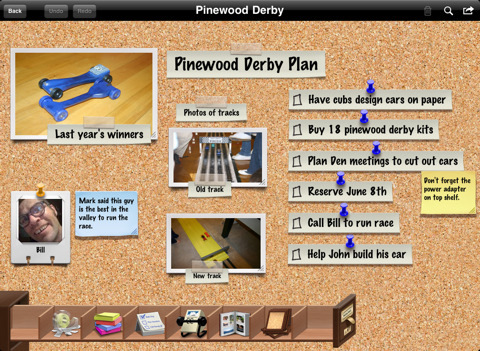 As the image above shows, Corkulous provides a corkboard for tasks, notes and images, and the flexibility to move them around freely and have boards nested within other boards. As a basic idea it holds promise, but is not yet fully featured sufficiently to do much more than plan a shopping trip. But what the app does suggest is the potential for visual thinking on the iPad. Popplet builds on this in a more visually useful way, incorporating aspects of mindmapping. Like Corkulous, it is a promising app, but it falls down in terms of export options – which are limited – and not fully using the distinctive interface of the iPad. It is also overpriced. iThoughtsHD is by far the best visual thinking tool for the iPad. Unlike Corkulous and Popplet, it recognises that the user will, at some point, want to transfer the ideas developed into another application and work on them further. The export options are comprehensive, and overall the app has a real sense of quality to it. I use writing as a way of developing ideas, so a good writing app is essential. Right now there is only one serious contender – Writer. Steven Fry loves it, which may or may not persuade you, but as a former Rector of the University of Dundee it should! A beautiful writing environment, uncluttered, simple, focussed. This is where the iPad excels, and proves itself as far more usable than a laptop. It is, simply, a brilliant device for reading and navigating. So, I’m off to a conference in London. All the files I need – PDFs, DOCs, Pages and image files, etc. – I transfer onto the iPad with GoodReader. It’s a very simple but effective document reader, keeping everything accessible in one place, such as conference agenda, maps, hotel bookings, etc. Any file I think I’ll need to edit, such as speaking notes, I transfer into Notebooks. On the way down on the train, I use the time to read some articles and academic papers. Papers is an application for the Mac, iPad and iPhone by Mekentosj that describes itself as “your personal library of research”. As I written elsewhere, it is an outstanding application that lets you find, download, file and tag research papers. The parts of your library you want to transfer to the iPad are then accessible for reading. You can also search online and download them from the iPad version of Papers, although – to be honest – it’s easier to do this from the Mac version. And the iPad is just great for reading. Other tools I use on on the Mac, such as Instapaper, are also available as iPad apps. As for an RSS feed reader, Pulse is easily the best. It was designed in five weeks by two graduate students and has a beautiful mosaic type interface to browse items in your feeds. It has such a well considered design which many other apps could usefully learn from. It costs around two pounds, and is worth every penny. 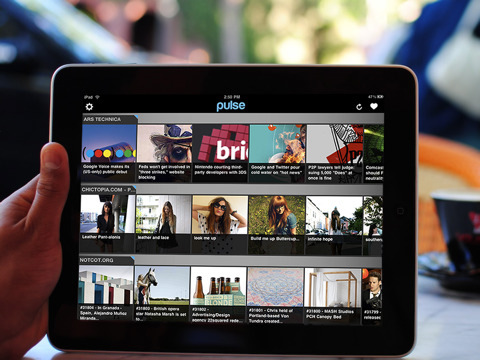 Flipboard – like Pulse – is one of the few apps so far that really ‘gets’ the iPad. It’s a twitter and facebook reader that turns the content into a magazine style output that totally enhances readability. Just use it – you’ll see how it makes a difference to your use of twitter. Let’s begin with micro-dissemination via twitter. On the Mac I use TweetDeck, and had tried with the iPad version, but it kept crashing and appears fairly buggy. I’ll try it again if another version is released, but in the meantime I’ve become a fan of Osfoora HD. Like Pulse, it has a beautiful, elegant design with great usability and all the functionality that you need. Next, blogging – and given the location of my blog – WordPress for iPad – is a useful app that works well. Overall the iPad is good for informal presentations of work. All singing and dancing Keynote presentations do not work – so little of the Mac’s Keynote functionality transfers over to the iPad – but I have found that slideshows of images, or playing videos works very well, with people gathered around to see. It provides more informality to ‘presenting your work’. The great thing about the iPad is getting away from bloated, over specified software that simply gets in the way of doing things. The apps above, especially the outstanding ones, do only one thing, but do it spectacularly well, making full use of the iPad’s interface. And who am I to write all this? Well, I do research and writing for a living, so I’ve some justification for sharing my views. Also, I have a bit of experience using such devices. 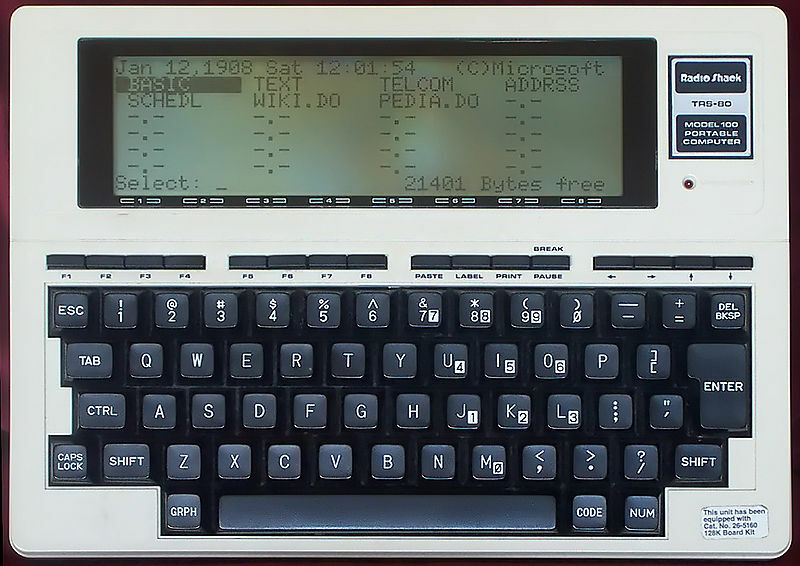 Back in 1985, when computers were small on memory and functionality, and their users were big on hair and shoulder pads, I bought a Tandy TRS-80 – a little laptop with 32K memory and a tiny text only screen. But it was mobile and had a built in modem, and I thought it was magic. It synced with my Amstrad PCW. Well, I say “sync”. Back then “sync” was just a fancy way of describing an avocado coloured washbasin. I actually wrote part of a book chapter on it, and remember sitting in Hyde Park on a sunny day with the Tandy on my lap thinking that this was the way to go. Of course, the 32K of memory filled pretty quickly so after an hour’s work in the park, all I could do was feed the ducks. It’s taken 25 years, but now it really is the way to go. Does anyone know of a virtual duck feeding app?